It’s got to be pretty exciting to be a Bitcoin Cash holder. Hours after Avnet announced their partnership with BitPay, one of the world’s largest crypto processor, allowing their clients to settle with Bitcoin Cash and Bitcoin, Vardex Suisse—the Switzerland based blockchain and Point of Sale operator which is also a regulated firm which provides access to digital assets including Bitcoin and Litecoin in all of their ATMs, now supports Bitcoin Cash. strong sell pressure at $160, our immediate resistance level. All the same, bulls are firm and have satisfactorily reversed losses of Feb 24, an important reference bar in the last month. 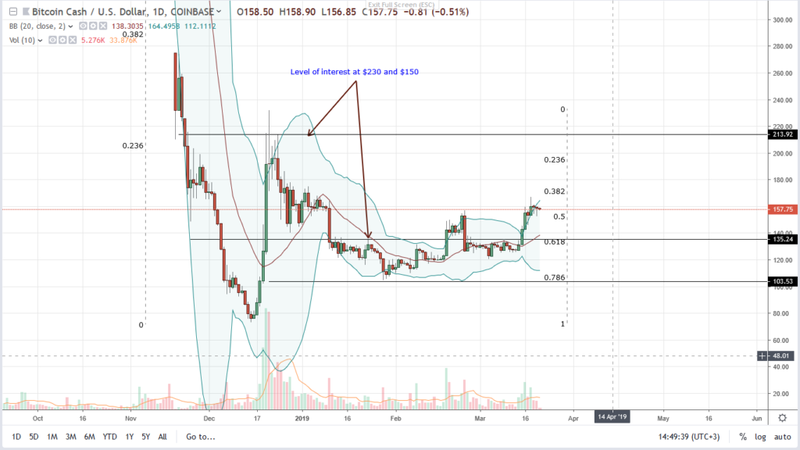 Despite our optimism and expectation of higher highs towards $230, our ultimate target marking Dec 2018 highs, we shall adopt a wait and see approach aware that failure of buyers to build momentum and close above $170 is bearish for BCH. percent Fibonacci retracement level of Dec 2018 high-low. losses but accompanying volumes are low. might be the necessary impetus for a possible BCH rally.